Peter Weston - ZineWiki - the history and culture of zines, independent media and the small press. The cover of Peter Weston's Hugo-nominated hardcover memoir With Stars in My Eyes (2004). Cartoon by Harry Bell; design by Alice N S Lewis. Peter Weston (1943-2017) was an award-winning British fanzine editor. Peter Weston has the distinction of winning the first Nova Award for Best Fanzine, presented in 1973, for his fanzine Speculation. Weston had begun the fanzine in 1963. Weston had released it under the title Zenith for the first six issues, which lasted from 1963 till 1964, unaware that Harry Turner has previously published a fanzine of the same name in the 1940s. Upon discovering this, he renamed the zine Zenith Speculation for issues 7 to 13, between 1964 and 1966. At that time it assumed its final identity, Speculation. His current project is Relapse, a former 1980s apazine which was relaunched in 2006 under the title Prolapse and received a Nova Award for Best Fanzine in 2007; the 2007 Novacon committee added a further Nova Award for "Best Fan". Prolapse won again in 2008. That same year it also received the FAAn Award for Best Fanzine. In 2009 he amended the title to Relapse. 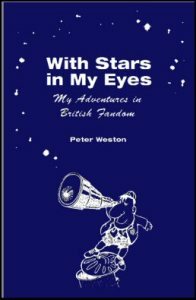 Weston chronicled his early involvement with fanzines and conventions in With Stars in My Eyes: My Adventures in British Fandom (NESFA Press, 2004), which earned him a Hugo Award nomination. This page was last modified on 19 March 2019, at 13:53.